Here in the United States, we are a nation running on empty. One in three men and women report experiencing a sleep disorder. The most common disorder is insomnia: difficulty falling asleep, staying asleep, and/or feeling well rested. Most people have experienced this at some point in their lives, but for many, it becomes an exhausting way of life. Other common sleep disorders include sleep apnea, restless leg syndrome, and narcolepsy. It is generally recommended that adults get 7 to 8 hours of sleep; yet, 35% of us get less than that. So, what happens? People are tired. And as a result of exhaustion, it is difficult to focus, concentrate, and remember. Work and school performance decrease, troubles may arise in relationships with others, and accidents on the road and in the workplace are more likely. Feelings of irritability, aggression, and depression may become more common and harder to control. Basically, a lot of people are experiencing a reduction in quality of life in direct proportion to the reduction in their ability to get a good night’s sleep. And the long-term implications are not good either. People who don’t sleep well over time are more likely to experience heart disease, stroke, diabetes, obesity, and depression (https://www.ncbi.nlm.nih.gov/books/NBK19961/). Why is it so hard for so many Americans to regularly achieve quality sleep, and what do they do about it? Stress, anxiety, excessive worry, depression, pain/discomfort, poor sleep hygiene, consuming too much caffeine or alcohol, environmental disturbances such as light, noise, or temperature, and certain medical conditions are some common reasons why people find their sleep disrupted. Sounds like the modern-day American lifestyle isn’t very conducive to a good night’s sleep. Cannabis can help improve sleep quality by nourishing our endocannabinoid system (ECS). Every day our bodies go through a cycle of sleeping and wakefulness. This is called the circadian sleep-wake cycle and the endocannabinoid system (ECS) plays an important role in the regulation of this cycle (https://www.med.upenn.edu/cbti/assets/user-content/documents/s11920-017-0775-9.pdf). The endocannabinoid system is a system in our bodies that contains receptor sites and helps to regulate many of our body processes, including the circadian sleep-wake cycle. Sleeping poorly can become a vicious cycle as a lack of sleep causes our ECS to get out of whack. Cannabis fits into the receptor sites of our ECS which can help our bodies get back into a healthy sleep-wake cycle allowing us to experience better sleep. As many people who have used cannabis know from experience, THC has sedative properties. Several studies have shown that THC reduces sleep latency, which is the amount of time it takes to fall asleep.(https://link.springer.com/article/10.1007/s40429-014-0016-9). Additionally, some studies show an Increase in slow wave sleep, which is a deep phase of sleep when our brains recover the day’s activities, and a decrease in REM sleep, which is when most of our dreaming occurs. (https://www.med.upenn.edu/cbti/assets/user-content/documents/s11920-017-0775-9.pdf). However, when administered in large doses or to people who aren’t regular cannabis users, it can actually do the opposite: increase the amount of time it takes to fall asleep. Yet, many people self- medicate their sleep issues with THC rich cannabis. Fifty percent of long-term cannabis users (using cannabis for more than 10 years) use it to help them sleep. 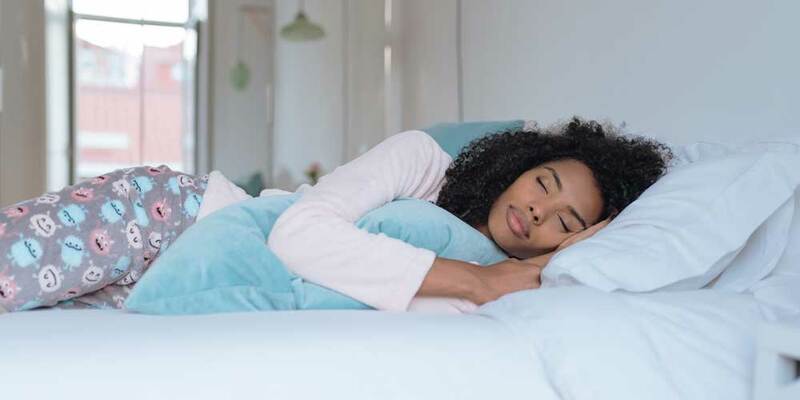 When using cannabis over time to improve sleep; however, many people find themselves dependent on its sleep-enhancing benefits. Ironically, when regular users stop taking cannabis, many of those who use it to improve sleep, disrupted sleep is a classic withdrawal symptom. (https://link.springer.com/article/10.1007/s40429-014-0016-9). Sleep Apnea, which occurs when a person’s breathing is interrupted during sleep, currently affects roughly 22 million Americans. Some people’s breathing is interrupted hundreds of times in one night! Studies using a synthetic form of THC called dronabinol have shown that it can be helpful in reducing the number of apneas. (https://www.med.upenn.edu/cbti/assets/user-content/documents/s11920-017-0775-9.pdf). More clinical studies need to be conducted to determine the efficacy of whole plant THC. Another condition that affects many Americans is PTSD. A common side effect of PTSD is nightmares. Studies with another synthetic form THC, nabilone, have shown a reduction in the frequency and intensity of nightmares along with increased number of hours of sleep. (https://www.med.upenn.edu/cbti/assets/user-content/documents/s11920-017-0775-9.pdf). Again, more studies need to be conducted using THC from the whole plant to show its affect on nightmares derived from PTSD. THC’s non- psychoactive friend, CBD, can also be helpful in the quest for better sleep. At medium to high doses, it has shown to increase total time asleep and reduce the frequency of arousals throughout the night. However, at low doses, it has been shown to be stimulating. (https://www.med.upenn.edu/cbti/assets/user-content/documents/s11920-017-0775-9.pdf). Many people turn to CBD to relieve anxious feelings, which can help to improve sleep quality since many people’s insomnia is rooted in anxiety (https://www.med.upenn.edu/cbti/assets/user-content/documents/s11920-017-0775-9.pdf). Pain can be a huge contributor to a person’s inability to get a good night’s sleep. Clinical studies have shown that a 1:1 ratio can improve sleep quality and reduce residual fatigue in patients experiencing pain and spasms, specifically neuropathic pain and pain associated with multiple sclerosis (https://s3.amazonaws.com/academia.edu.documents/32955826/43672361-Cannabis-Pain-and-Sleep-Lessons-from-Therapeutic-Clinical-Trials-of-Sativex-a-Cannabis-Based-Medicine.pdf?AWSAccessKeyId=AKIAIWOWYYGZ2Y53UL3A&Expires=1543963531&Signature=p3sJPmLWiLMuuOA7aCX3%2BC5i28k%3D&response-content-disposition=inline%3B%20filename%3D43672361-Cannabis-Pain-and-Sleep-Lessons.pdf). Finally, we’ll take a look at how terpenes play a key role in sleep. Terpenes are compounds that give cannabis and other plants their distinct aromas. Each terpene contains a suite of healing properties and each strain contains a unique profile of terpenes. If you’ve ever felt couch locked after consuming cannabis, you can probably thank myrcene, which is also found in hops. In addition to being a sedative, its other primary actions are reducing pain and inflammation. Linalool, which is also found in Lavender, has shown to have sedative and anti-anxiety properties, as well. B-Caryophyllene, one of the most commonly found terpenes in cannabis strains, is a potent anti-inflammatory agent and also found in black pepper. Perhaps looking at the terpene content in different strains of cannabis can help explain why cannabis can have varying effects on people’s sleep patterns (https://bpspubs.onlinelibrary.wiley.com/doi/pdf/10.1111/j.1476-5381.2011.01238.x). A lot of factors are at play when using cannabis to help with sleep disorders: correct dosage, choosing CBD or THC, and finding a strain with the right terpene profile. In addition to cannabis, there are many other things you could try to help get a better night’s sleep. Studies have shown that the soft blue glow from phones, computers, and TV’s can be stimulating, so try powering down an hour or two before bedtime. Try to avoid caffeine after 2:00 pm and excessive alcohol in the evenings. Exercise can be a great ally in the quest for sound sleeping. Sticking to a bedtime and wake up schedule, even on the weekends, can help. Take time out of your evening and get into the habit of a relaxing bedtime routine. There is no sure fire way to guarantee a good night’s sleep, but practicing a healthy lifestyle is a great first step.